Command Line Interfaces (CLI’s) are a developer’s best friend. 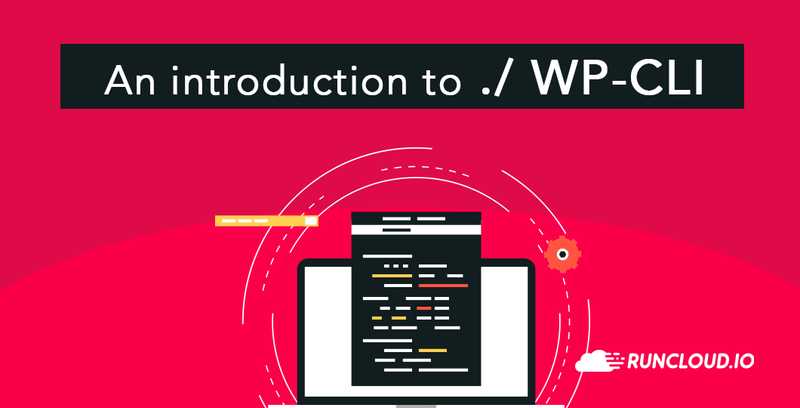 WP-CLI, the WordPress Command Line Interface (WP-CLI) is an indispensible component of any serious WordPress developers toolkit. If you are a developer working in the WordPress ecosystem and managing dozens of WordPress sites (or more), you can drastically reduce your workload, whilst increasing your efficiency and productivity by installing and utilising the WordPress Command Line Interface. No wonder then, WP-CLI development has been brought under the fold of WordPress.org. WP-CLI, alongside the REST API and the new Gutenberg editor, will play a central part in development for the WordPress platform going forward. 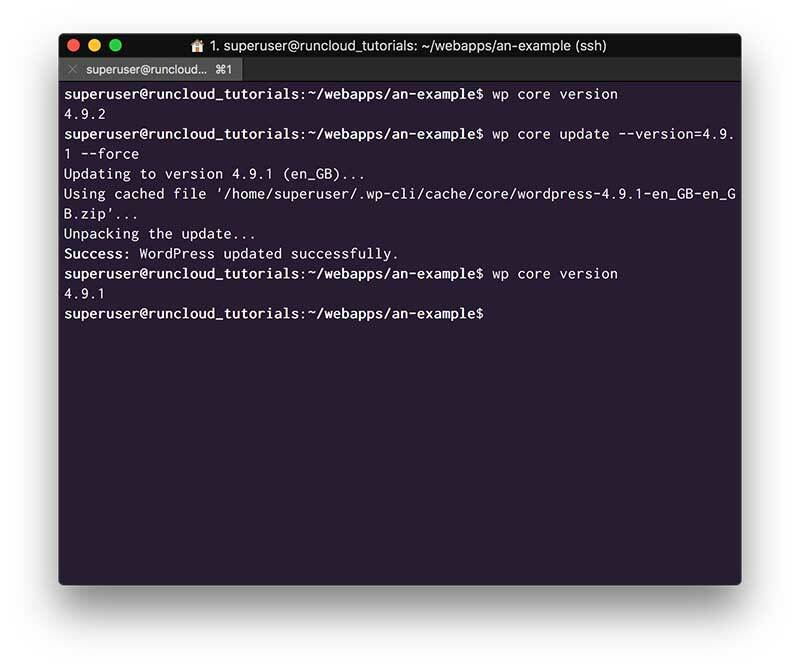 In this short tutorial, we will install WP-CLI to a RunCloud managed server. After that, we will take a (very) brief look at the anatomy of some of the commands that make WP-CLI so useful. We will end the tutorial by creating a global WP-CLI configuration file, that we will use in future tutorials. In my tutorial examples, I will be logging in to a server using passwordless login via SSH. I will be doing this as a superuser with root administrative privileges. When necessary I will be using the sudo*** command to execute commands as an administrator. If you don’t have a **superuser account, you can create one by following this tutorial. Alternatively you can throw caution to the wind and live life on the edge, by just logging in to your server as root user and omitting the sudo command. A typical WP-CLI command structure starts with wp followed by a command, then a subcommand and finally –options-with-value=value and –options-without-value. First, change directory into the root folder of one of your WordPress sites. We can easily check the WordPress version, and update it. 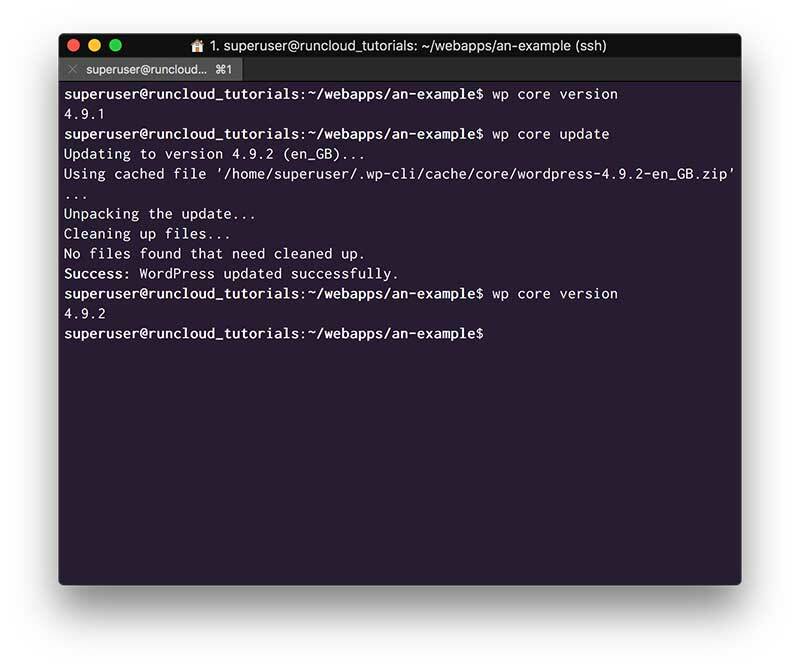 Check your version of WordPress Core and update it easily! We can list the plugins our WordPress sites plugins, and see their version, whether there is an update, and their activation status easily using the ‘list’ command. My example site is a fresh install so it includes those wonderful complimentary plugins included in core, ‘Akismet’ and ‘Hello Dolly’. I am joking, I hate those plugins and the first thing I do on any new site is delete them. Now its easier than ever, just use the delete command. When executing actions on plugins or themes, you use the slug from the WordPress repository. Install a plugin with a simple command. Rolling back a Plugin with ease! A common problem you may encounter is when an update to a plugin leads to a conflict. Sometimes you need to make the choice to roll back the plugin to the previous version until there is a fix. If you use the browser and a GUI, this is a bit of a headache. First you need to deactivate the plugin, then delete it, then you need to search for it’s previous version at WordPress.org, download it locally, upload it via the WP-Admin plugin screen, install it, then activate it. This is an 7 step process and an utter annoyance. 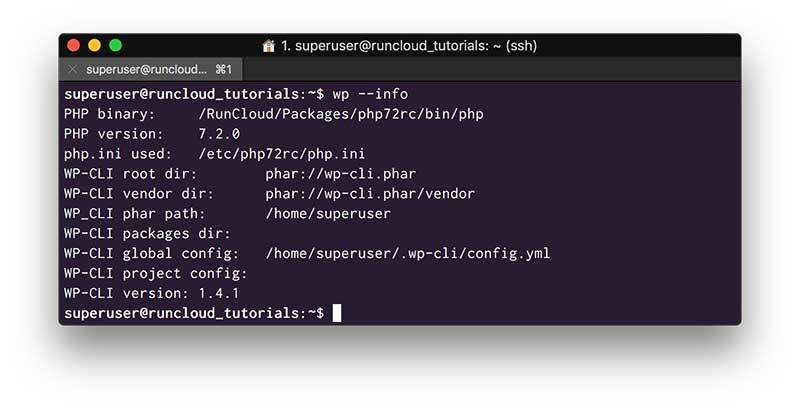 With WP-CLI you can say goodbye to those 7 steps forever. Now you just need update to a previous version. In my case, I will roll back ‘Regenerate Thumbnails’ to the previous version. Rolling back a plugin is no longer an 7 step headache! 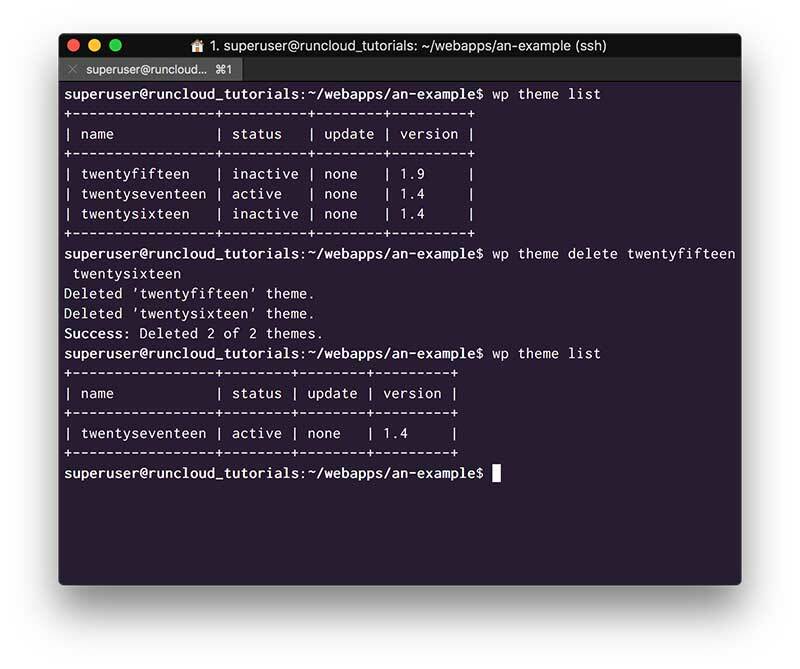 The WP-CLI Theme command utilizes the same subcommands as the WP-CLI Plugin command, so you can list, search for, install, uninstall, activate, deactivate, update, rollback and delete Themes. Let’s check our themes and delete any unnecessary ones. List out your Themes and delete the redundant ones. Rolling back a Theme is just as easy! Believe me when I tell you, this is just scratching the surface. 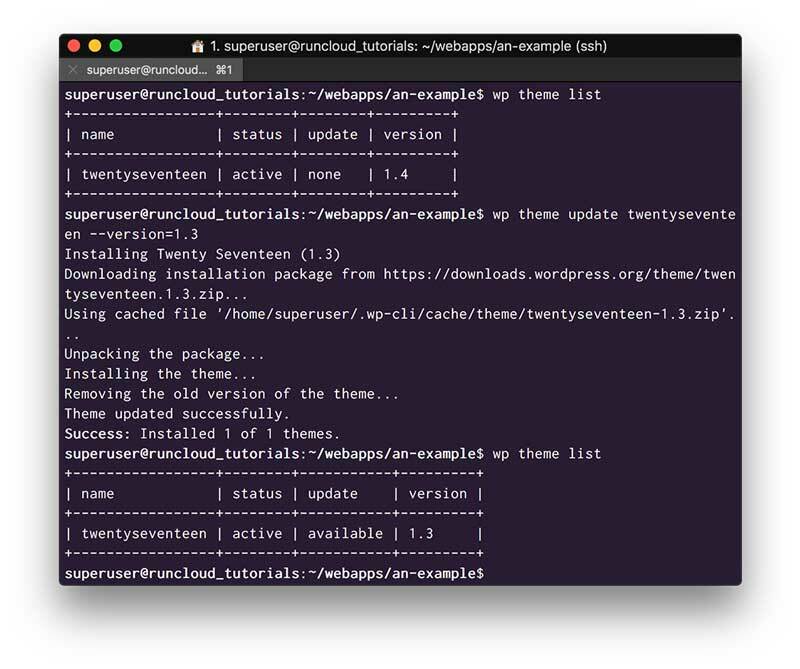 A full list of WP-CLI commands can be found on the WordPress.org Developers Site. In a future tutorial I will be taking a much deeper dive into some of the most useful commands. Another great thing about WP-CLI is it’s extensibility, we will also look into this in a later tutorial. WP-CLI uses YAML configuration files to set default configurations and parameters. These can be set at either the global (server) level, or at a local project directory level. A local wp-cli.local.yml file inside the current working directory (or upwards). Another local wp-cli.yml file inside the current working directory (or upwards). 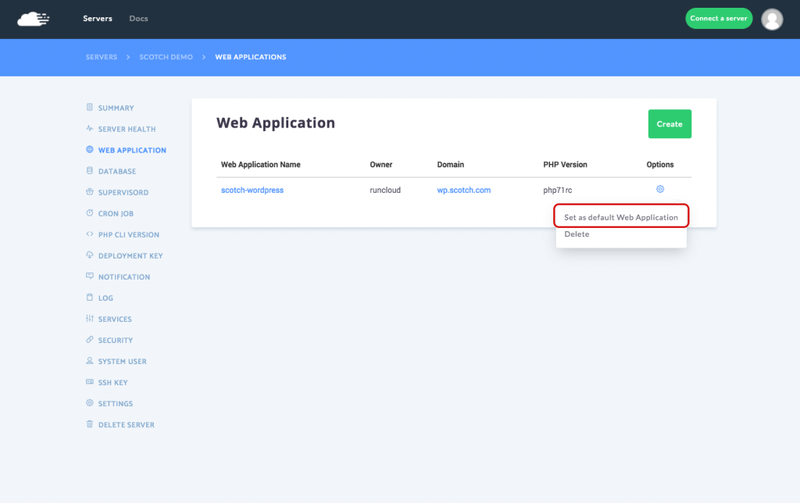 We are going to create a Global Configuration file, ‘~/.wp-cli/config.yml’ and add soem default configuration parameters. The ‘.wp-cli’ directory inside our user home directory is not automatically created. First let’s add that directory mkdir ~/.wp-cli, change into it cd ~/.wp-cli, and create and open the configuration file for editing nano config.yml. 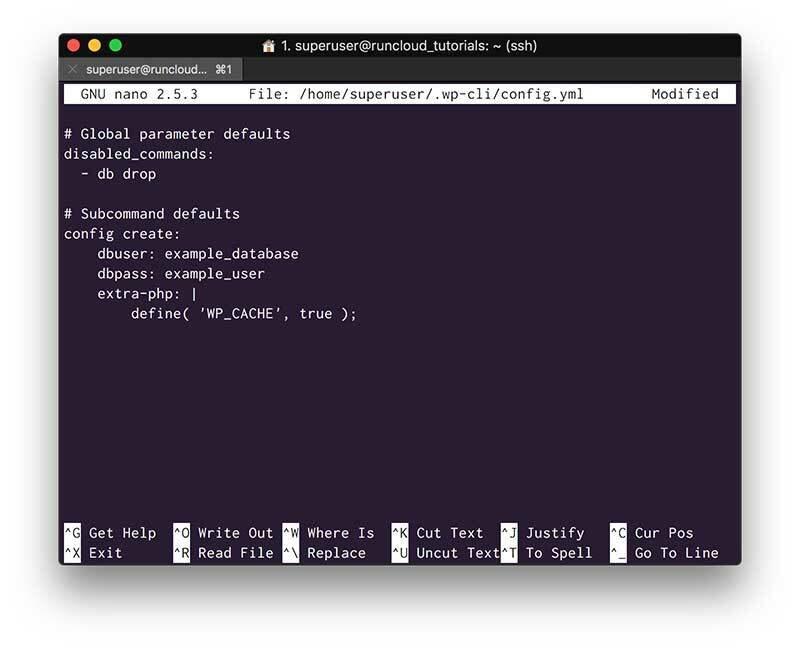 Set your WP-CLI defaults and Global Parameters in the configuration file. 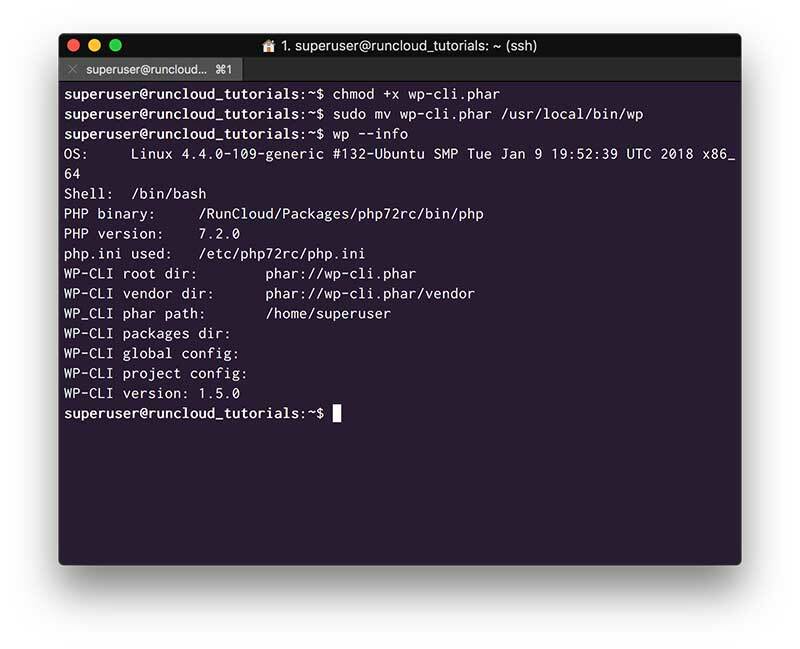 With WP-CLI it is very easy to work on the Database. Some of the Database commands are the most powerful, but risky. To mitigate some of that risk, I have disabled the ‘db drop’ command. I can perform tasks on my database now, but I can’t drop all the tables. I have also created some defaults for the ‘config create’ subcommand. Often we use the same database user and password for many different installations. Here I have set a user and password as a default, now when I use the ‘wp config create’ command, I would no longer have to set these specific sub commands and they would default to my preferred parameter. I always use caching with my WordPress sites, which usually means editing the ‘wp-config.php’ file, but here I have set it up so that whenever I create a ‘wp-config.php’ file with WP-CLI, it already includes this PHP definition. 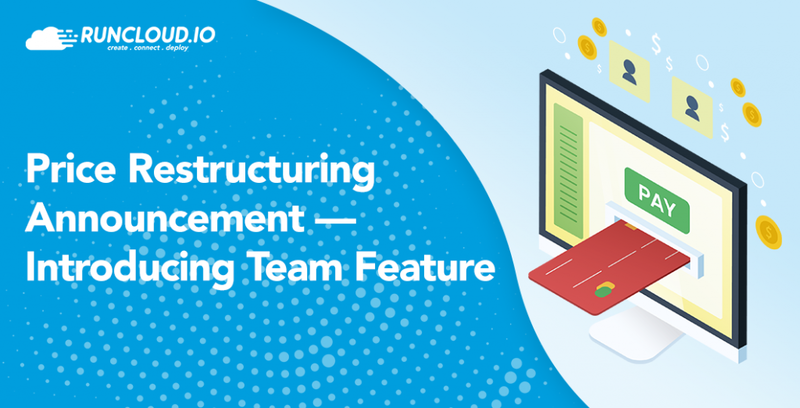 We often create sites with similar configurations, using this WP-CLI configuration file means we can stop repeating the same tasks over and over. You can find out more about WP-CLI Global parameters and Configuration files here. Now when you check wp –info, you will see the location of your Global configuration file in the output. As I mentioned earlier, this is just skimming the surface of the possibilities with the WordPress Command Line Interface. Not only the possibilities of the core WP-CLI commands, but the potential due to the packages that extend its abilities even further. Well…. You are right, but this tutorial was just a basic demonstration. In following tutorials we will dive deeper into the potential. You will see how some simple commands completely negate the need for many popular plugins. Learn how to manage your content, databases, posts, pages, speed up custom development and more. In another tutorial we will set up Aliases in our configuration file. We will use Aliases on a server, to manage multiple WordPress sites, on the same server, simultaeneously with single commands. We will then learn how to use Aliases and SSH to manage hundreds of WordPress sites across many multiple servers, with a single command, all from your local machine.